Following the opening of Sainsburys and the successful letting of industrial units Sinclair Clark is instructed on the resultant investment sales of industrial units. Please contact Vanessa Clark for further details. Plot 9 the last remaining industrial phase within phase 1 has attracted a trade counter pre let of 6,500 sq ft. This leaves units 9B and 9C available for sale or to let. Click here for details. Vanessa Clark will be in attendance at MIPIM in Cannes this year between Sunday 10th March and Saturday 16th March. Sinclair Clark is a sponsor of the Croydon stand. Please contact Vanessa via email or mobile on 07889 164 772. Sinclair Clark has forged a link with Teacher Marks to deal with client demand for rent reviews and third party referrals. 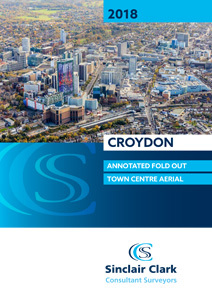 Projects in hand currently cover Croydon and Camden. New initiatives involving renewable solutions to energy provision, energy storage and innovative solutions are in hand between Sinclair Clark and Immersa via consultant Mark Deverell. Please contact us for details. Works to refurbish the 6th floor are nearing completion with the lobby area and toilets now being upgraded. The 6th floor provides 9,600 sq ft and is available now for immediate occupation on a new lease terms on application. A new brochure is in hand but please contact Vanessa for plans and further details. Acting on behalf of the Freshwater Group, Sinclair Clark have agreed short term lettings of the ground floor offices and the residential upper parts to Tide Construction who are delivering the modular residential tower for Graystar on the former Chroma site at 101 George Street. St Matthews House is part of proposed development plans which include 96 George Street and intended to provide 120,000 sq ft of new Grade A specified HQ Offices. Sinclair Clark are a sponsor of Croydon at MIPIM next year and Vanessa Clark will be in attendance throughout.